The yellow-eyed penguin / hoiho is only found in New Zealand, nowhere else in the world! Hoiho breed on the south-east coast of the South Island, Stewart Island / Rakiura, and the subantarctic Auckland / Maungahuka and Campbell Islands / Motu Ihupuku. The birds in the subantarctic are genetically distinct from those on the mainland, as they very rarely mix. 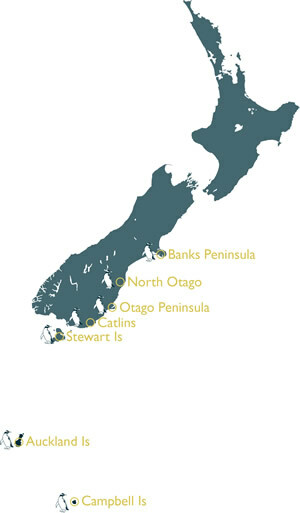 There are four major breeding regions on the mainland: Banks Peninsula, North Otago, Otago Peninsula and the Catlins. Juvenile hoiho tend to swim north from the breeding sites, sometimes dispersing as far as Taranaki and the Bay of Plenty. Hoiho live in native coastal forests, scrub or dense flax, although they also use pasture and exotic vegetation. Nest sites are carefully selected – a suitable site should have a solid back such as a log, rock or flax plant, and provide shelter from harsh weather and the heat of the sun. The nest itself is a shallow bowl typically filled with twigs, grass and other vegetation. Sites are accessed from the sea via rock platforms, or sandy / gravel beaches.